The information in this website belongs exclusively to Grow Strategy Pty Ltd. (“GROW|STRATEGY”). Copyright in the material contained in this website belongs to GROW|STRATEGY, LaurusMark or its partners. The content of this website is provided free of charge under a non-exclusive, non-transferable license for printing and use only by the individual who are either browsing or are signed onto this service, and only for that individual’s personal, non-commercial use. Any other uses of any of the information from this site require additional permission from GROW|STRATEGY or our respective partners. Permission to use documents (such as white papers, press releases, datasheets and FAQs) (“Documents”) from this server (“Server”) is granted, provided that (1) the below copyright notice appears in all copies and that both the copyright notice and this permission notice appear, (2) use of such Documents from this Server is for informational and non-commercial or personal use only and will not be copied or posted on any network computer or broadcast in any media, and (3) no modifications of any Documents are made. Use for any other purpose is expressly prohibited by law, and may result in severe civil and criminal penalties. Violators will be prosecuted to the maximum extent possible. Documents specified above do not include the design or layout of the grow-strategy.com website or any other GROW|STRATEGY owned, operated, licensed or controlled site. Elements of the GROW|STRATEGY website are protected by trade dress and other laws and may not be copied or imitated in whole or in part. No logo, graphic, sound or image from the GROW|STRATEGY website may be copied or retransmitted unless expressly permitted by GROW|STRATEGY. GROW|STRATEGY AND/OR ITS RESPECTIVE SUPPLIERS MAKE NO REPRESENTATIONS ABOUT THE SUITABILITY OF THE INFORMATION CONTAINED IN THE DOCUMENTS AND RELATED GRAPHICS PUBLISHED ON THIS SERVER FOR ANY PURPOSE. ALL SUCH DOCUMENTS AND RELATED GRAPHICS ARE PROVIDED “AS IS” WITHOUT WARRANTY OF ANY KIND. GROW|STRATEGY AND/OR ITS RESPECTIVE SUPPLIERS HEREBY DISCLAIM ALL WARRANTIES AND CONDITIONS WITH REGARD TO THIS INFORMATION, INCLUDING ALL IMPLIED WARRANTIES AND CONDITIONS OF MERCHANTABILITY, FITNESS FOR A PARTICULAR PURPOSE, TITLE AND NON-INFRINGEMENT. IN NO EVENT SHALL GROW|STRATEGY AND/OR ITS RESPECTIVE SUPPLIERS BE LIABLE FOR ANY SPECIAL, INDIRECT OR CONSEQUENTIAL DAMAGES OR ANY DAMAGES WHATSOEVER RESULTING FROM LOSS OF USE, DATA OR PROFITS, WHETHER IN AN ACTION OF CONTRACT, NEGLIGENCE OR OTHER TORTUOUS ACTION, ARISING OUT OF OR IN CONNECTION WITH THE USE OR PERFORMANCE OF INFORMATION AVAILABLE FROM THIS SERVER. THE DOCUMENTS AND RELATED GRAPHICS PUBLISHED ON THIS SERVER COULD INCLUDE TECHNICAL INACCURACIES OR TYPOGRAPHICAL ERRORS. CHANGES ARE PERIODICALLY ADDED TO THE INFORMATION HEREIN. GROW|STRATEGY AND/OR ITS RESPECTIVE SUPPLIERS MAY MAKE IMPROVEMENTS AND/OR CHANGES IN THE PRODUCT(S) AND/OR THE PROGRAM(S) DESCRIBED HEREIN AT ANY TIME. This website may contain hyperlinks to other websites unrelated to GROW|STRATEGY. Similarly, other websites may contain hyperlinks to us. Such links to third-party web sites are provided for reference only, and hyperlinks to or from this website do not imply endorsement of the material on the sites or association with the operators. GROW|STRATEGY does not control such websites, and is not responsible for their contents. Copyright © 2014 GROW|STRATEGY and/or its suppliers, 65 York Street, Sydney, NSW 2000, Australia. All rights reserved. GROW|STRATEGY products referenced herein are either trademarks, registered trademarks or pending trademarks of Grow Strategy Pty Ltd. Other product and company names mentioned herein may be the trademarks of their respective owners. Any rights not expressly granted herein are reserved. 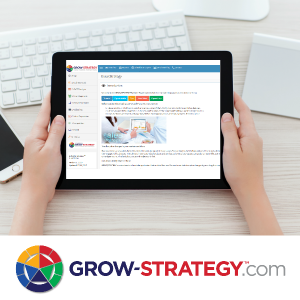 Contact info@grow-strategy.com with questions or problems, as appropriate. Any claims arising out of the use of the GROW|STRATEGY website shall be resolved by arbitration in NSW, Australia. The laws of the NSW (other than conflicts of laws rules) and of Australia shall apply. The arbitration shall be conducted by a single arbitrator engaged in the practice of law. The arbitrator’s decision and award shall be final and binding and may be entered in any court with jurisdiction.